Scientists have found evidence of a catastrophic event they believe was responsible for halting the birth of stars in a galaxy in the early Universe. They report their results in the journal Monthly Notices of the Royal Astronomical Society. The researchers, led by Durham University’s Department of Physics and funded by the Royal Society and Royal Astronomical Society say the massive galaxy, SMM J1237+6203, underwent a series of blasts trillions of times more powerful than any caused by an atomic bomb. The blasts happened every second for millions of years, according to the scientists. The explosions scattered the gas needed to form new stars by helping it escape the gravitational pull of the galaxy, effectively regulating its development. The Durham-led team believes the huge surge of energy was caused by either the outflow of debris from the galaxy’s black hole or from powerful winds generated by dying stars exploding as supernovae. SMM J1237+6203 lies in the direction of the constellation Ursa Major and is so far away that we see it as it appeared 10 billion years ago, or three billion years after the Big Bang, when the Universe was only one quarter of its present age. Properties seen in massive galaxies nearer to our own galaxy, the Milky Way, suggest that a major event rapidly turned off star formation in galaxies early in the history of the Universe and stopped them from expanding. Theorists, including scientists at Durham University, have argued that this could be due to outflows of energy blowing galaxies apart and preventing further new stars from forming, but until now evidence for this has been lacking. Using the Gemini Near-Infrared Integral Field Spectrometer (NIFS) to measure the speed of material in the galaxy, they found huge outflows powerful enough to help star-forming debris escape the galaxy’s gravitational pull. They believe the colossal energies generated by these outflows of energy were enough to suppress any further star formation in the galaxy. 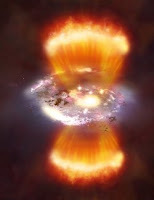 Dr Dave Alexander, of Durham University’s Department of Physics, said: “We are looking into the past and seeing a catastrophic event that essentially switched off star formation and halted the growth of a typical massive galaxy in the early Universe. ‘Effectively the galaxy is regulating its growth by preventing new stars from being born. Theorists had predicted that huge outflows of energy were behind this activity, but it’s only now that we have seen it in action. The Durham-led team now plans to study other massive forming galaxies in the early Universe to see if they display similar characteristics.